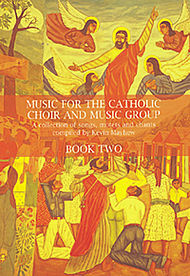 Enjoy the uplifting experience of singing catholic gospel songs with this newly published book , “Music for the Catholic Choir and Music Group” – Book 2, by Kevin Mayhew. This special book includes a selection of Mayhew’s song collection that will be sure to make an impressive gift for everyone on your list. This book is composed of a variety of spectacular religious songs that are uplifting, inspiring, and soothing to the soul. Many of these songs are designed to boost strength and encourage peacefulness and relaxation. This book will help your loved ones alleviate some of the stress and pressures they experience from living in this difficult world. With the holiday season upon us, celebrate the birth of our Lord Jesus Christ with these gracious songs. With this Music for the Catholic Choir and Music Group – Book 2, your loved ones can enjoy singing motivational and life inspiring songs whenever and wherever they choose. Give a gift of continuous hope this wondrous holiday season with this Music for the Catholic Choir and Music Group Book 2.